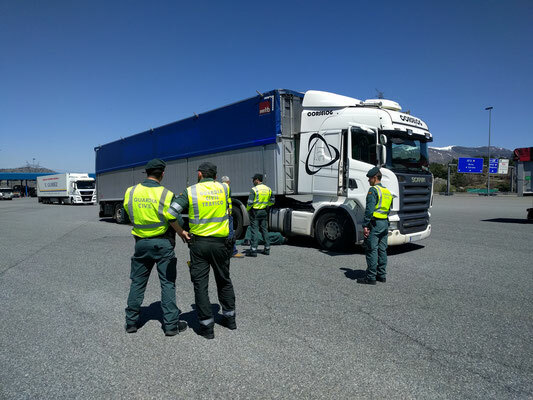 Thanks to the LIFE GySTRA project, Opus RSE has worked with the Spanish Civil Guard to find lorries manipulated on the spot and denounce them. The press release of this police force can be seen here. 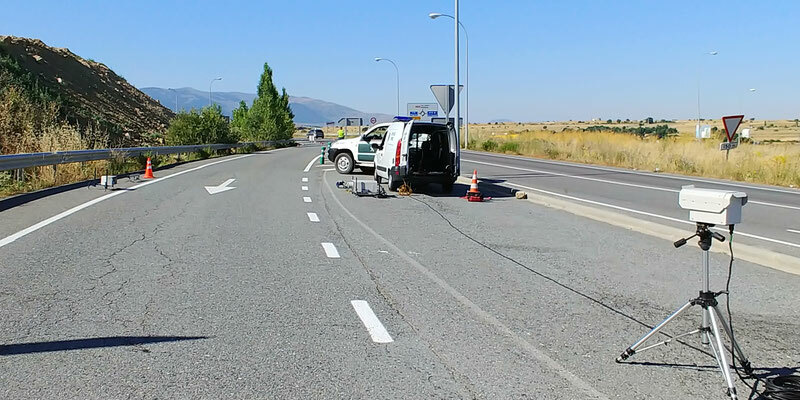 EUROPOL has also published these results, as the Spanish police have collaborated with authorities in France and the United Kingdom. 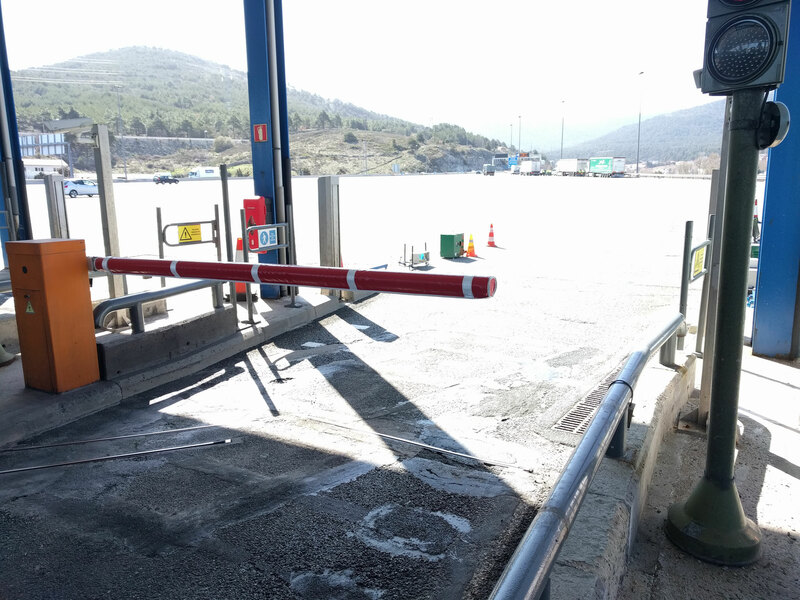 Many trucks travelling on European roads may be circulating with their emission control systems disconnected, which implies a massive emission of NOx into the atmosphere. The SCR system is mandatory on Euro 5 and Euro 6 trucks (some Euro 4 also include it). This system neutralizes almost all nitrogen oxides emitted by heavy-duty trucks. However, this system can be disconnected with an emulator that "tricks" the truck. 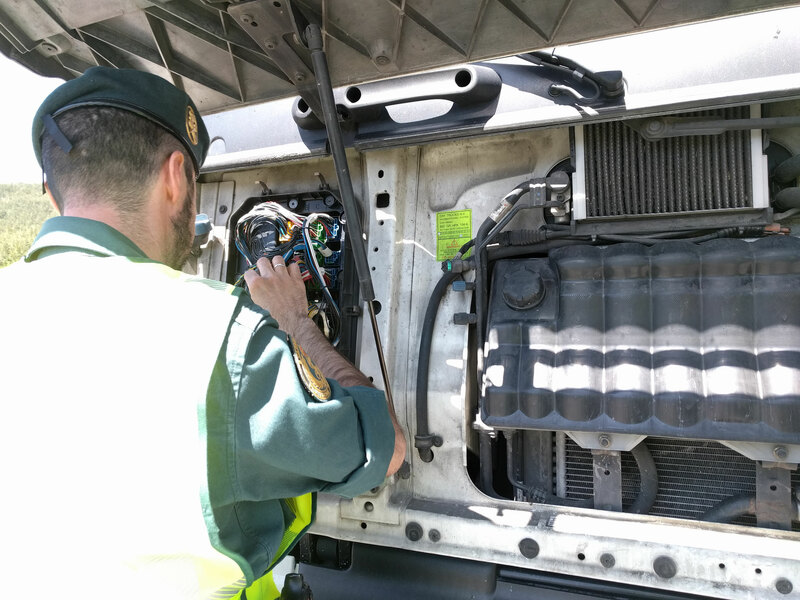 The Guardia Civil organizes operations in which the Opus Remote Sensing Device is used to remotely measure the actual emissions emitted by each truck. If a vehicle emits high amounts of NOx, a warning is instantly given to the police who stop the truck and inspect it. 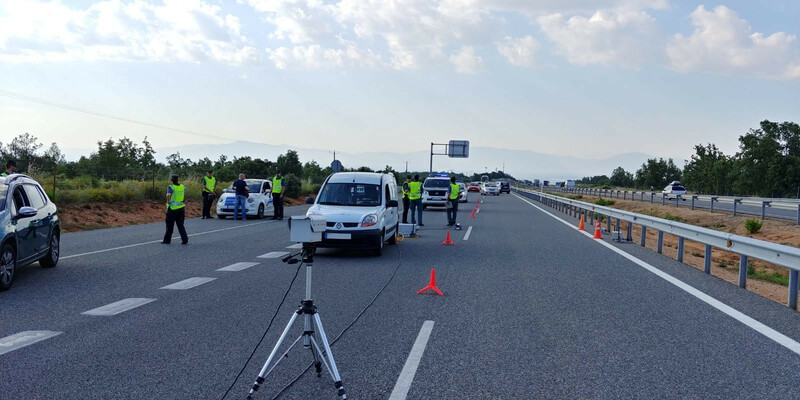 The success of these operations has shown that the police finally have a tool that allows them to find manipulated vehicles on the roads on a massive scale. It is hoped that the application of this technology will make it possible to tackle fraud that is currently out of control in Europe. This is the massive fraud in emissions from trucks in Spain. 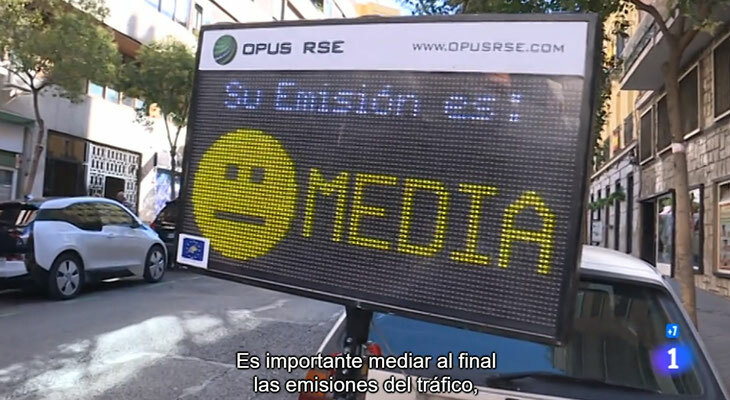 Opus RSE has been part of the documentary " The asphalt jungle" broadcasted by the first national TV channel in Spain. 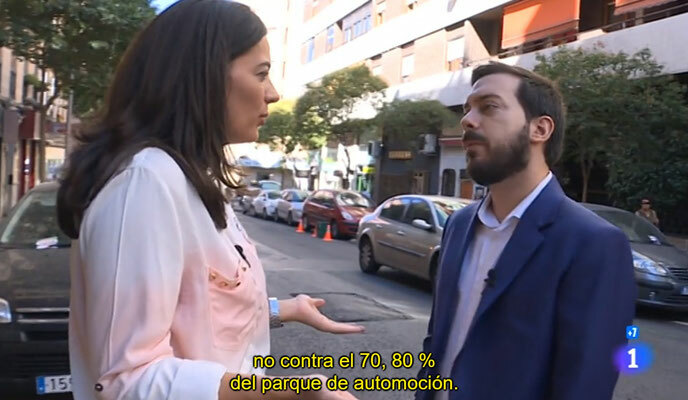 Comando actualidad - "Jungla de asfalto"
The documentary analyzes the new restrictions to the circulation of diesel vehicles in Barcelona and Madrid, which are causing a commotion in the citizens, who now do not know how much longer they will be able to drive their vehicles. The car is the most important investment of Spanish families, only behind the house. Thousands of families are currently considering what car to buy and how to move around in their city. The documentary shows one of the RSDs placed in Madrid within the LIFE GYSTRA program, which is measuring the emissions of motor vehicles in the Spanish capital for 2 years. 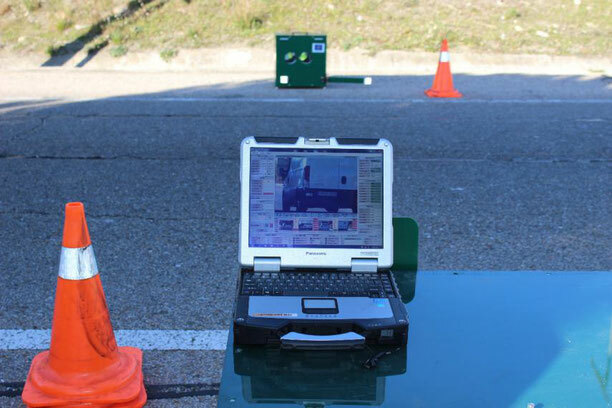 Each of these devices is placed on the road and, in a matter of a few minutes, begins to measure the exhaust emissions of all vehicles that pass in front of the device autonomously. 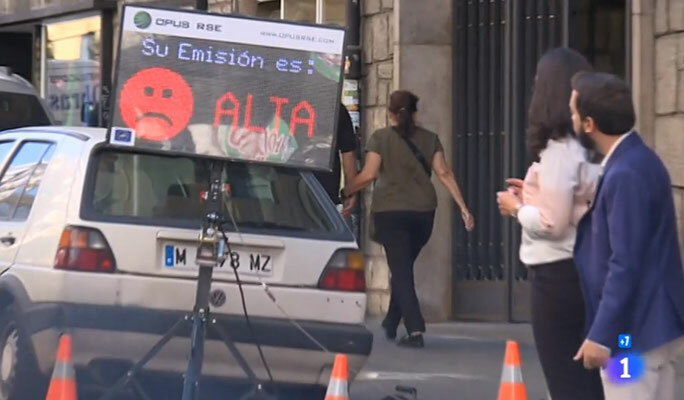 In the TV show, broadcasted in prime time, the importance of measuring the real emissions of all vehicles is explained, so as not to continue implementing generalist policies or policies based on theoretical information, which can harm citizens enormously. Highly polluting vehicles can be diesel, petrol, cars or motorcycles. One must have real information in order to legislate. 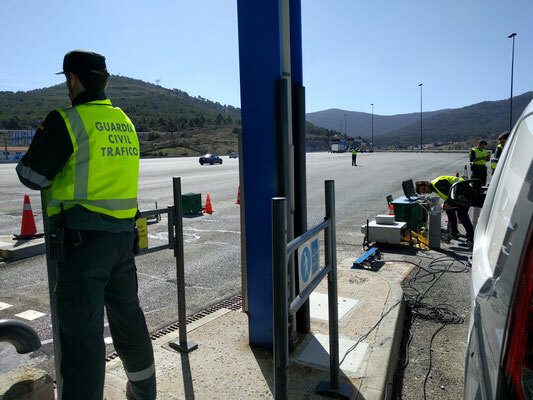 LIFE GYSTRA and Opus' remote sensing technology make it possible to know the real emissions of the vehicles and provide information that can be easily interpreted by public administrations. Thanks o this, they can regulate traffic in the most efficient and least costly way for the citizen's pocketbook. Two years after the famous 'Dieselgate', the European Union has found indications that some brands are trying to distort emissions in the most gross way, to avoid new upcoming regulation. In 2020, the European Union will adopt a new regulation that will set new limits on the pollutants emitted by the vehicles. To this end, the EU is collecting data to establish these limits carefully. Apparently, manufacturers are modifying the engines of the vehicles that are being tested to make them more dirty. Their objective is to raise the limits the EU will set in 2020. Yeah, it is the same technique as retail stores that raise prices before sales. According to the Financial Times, the EU has found indications that several manufacturers are involved in this practice and fears that the measurements made so far are already too distorted. Moreover, it looks like there is not a single method as there was in the 'Dieselgate' scandal. For instance, in some hybrid models, the tests have been carried out with the battery almost exhausted, which forces the engine to use more fuel, increasing the emissions. In others, simple tuning have been done to worsen performance, playing with the gears of the car. In a third type of fraud, the mechanism that stops the engine in short stops was deactivated to keep it running. Again and again it is shown that there can always be pitfalls in controlled tests. The only way to control vehicle emissions is to measure them over their lifetime and under real conditions. That is to say, to monitor the whole European fleet with the RSD systems. In a recent statement, Nissan has confessed that it altered the emission controls of some car models made in Japan. 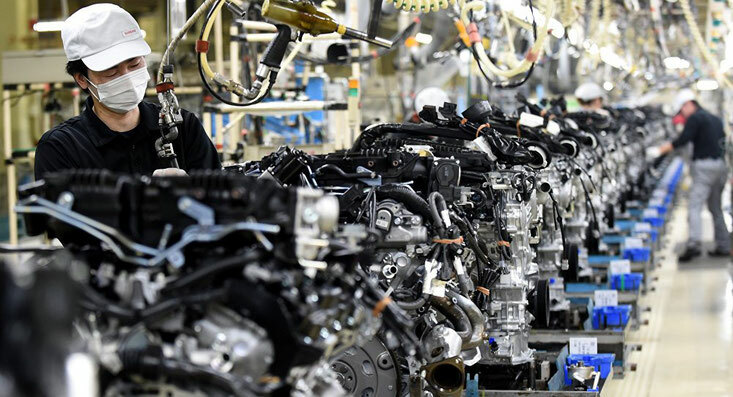 The Japanese car manufacturer Nissan acknowledged on Monday that it had altered some of the results of the anti-pollution tests on the models of the factories installed in Japan. The measurements of gas emissions and fuel use tests were not carried out according to the "established protocol" and the inspection reports were based on altered values, according to Nissan in a statement, after it was submitted to the Japanese authorities. Despite this, the company claims that most of its vehicles (with the exception of the GT-R, a sports car of the brand) do comply with the data in the catalogues. These disclosures arise from controls initiated in September 2017, after being asked to do so by the Japanese authorities. Nissan reports that they have detected "misconduct for vehicles produced at their national vehicle production plants and those of their affiliates". The company reports that the fraud was based on the modification, by an undetermined number of employees, of the conditions under which these tests are carried out, in terms of temperature, ambient humidity or the speed at which the vehicles are subjected to, for example. Other times the tests did conform to the guidelines set by the law, but the results were changed directly. Nissan, said that the number of vehicles affected by these malpractices currently stands at 1171, produced in five different factories from 2013 to a few weeks ago. Illegality affects only cars sold on national territory, not those exported. Nissan is once again in the spotlight of the emissions scandal. This case is not the same as the one that was uncovered at the German manufacturer Volkswagen - which went so far as to use illegal software to falsify the laboratory controls of thousands of cars. But it does mean a new infringement of the system of checks on cars. 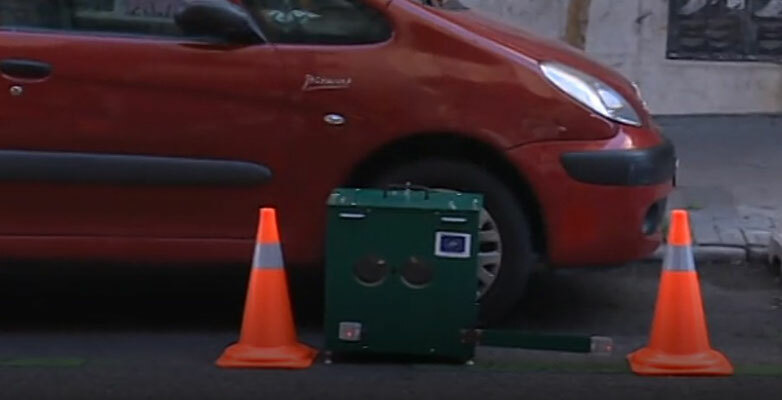 Most of the newest diesel cars in European cities and throughout the continent are polluting the streets with nitrogen oxide (NOX) emissions up to 18 times the levels set by Euro vehicle standards, says The Real Urban Emissions (TRUE) Initiative, launching its car ratings scheme and checker on 6th June. Measurements of the real-world emissions of over 350,000 cars on the roads in Europe, have been used to create an innovative and interactive new database ranking vehicles' NOX emissions. TRUE has used the International Council on Clean Transportation's (ICCT's) methodology to create a traffic light rating system which ranks cars based on their real-world nitrous oxide (NOx) exhaust emissions. Green is a 'good' rating, yellow is 'moderate' and red means that a vehicle produces more than 180 mg / km of NOx and is 'poor'. Anyone can search for the TRUE rating of a car by make, model, engine displacement, fuel type, and Euro standard. Four manufacturers had average emissions of more than 12 times above the approval limit. All Euro 6 diesel models tested exceeded the NOX emissions. Euro 6 petrol vehicle NOX emissions for even the worst factories were within 1.5 times the type-approval limit. 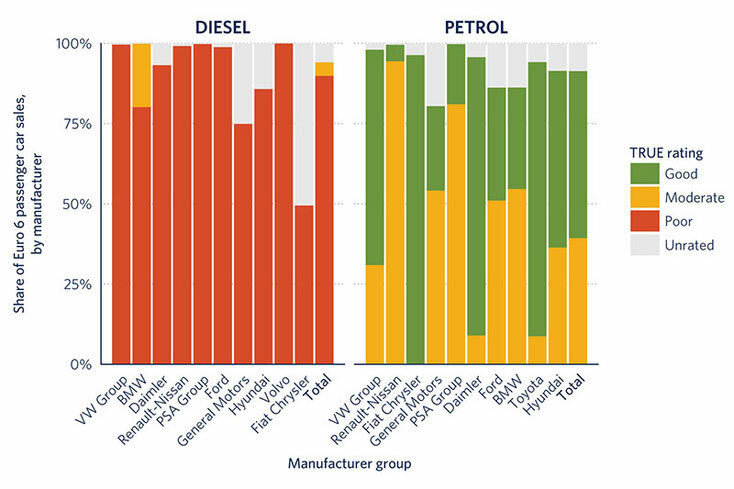 Even the best Euro 6 diesel groups produced NOX emissions of more than twice the type-approval limit, and the other manufacturer groups were at least four times the type-approval limit. 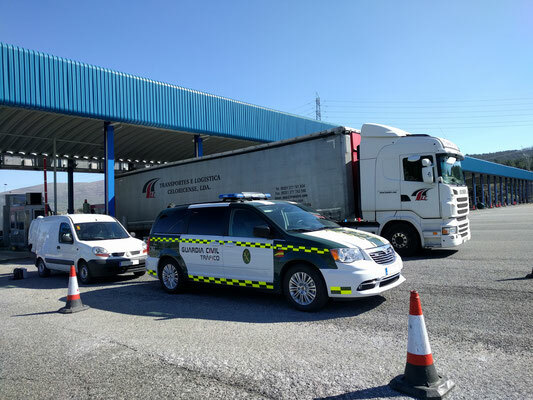 Euro 5 diesel families performed particularly poorly: All families had NOX emissions at least twice that of the limit, and the worst families had emissions 18 times the limit. The TRUE rating system uses data collected across Europe in the CONOX project, which was funded by the Swiss Federal Office for the Environment. It is the largest collection of data on vehicles emissions in Europe to be brought together so far. The measurements of the 375,000 individual cars from this data set have been used to create the TRUE ranking. 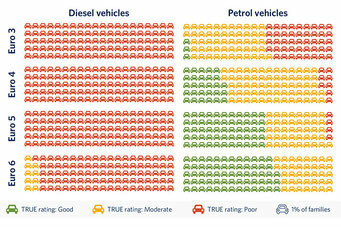 Further data from testing undertaken by TRUE in London and Paris will be added to the rating system in the future. 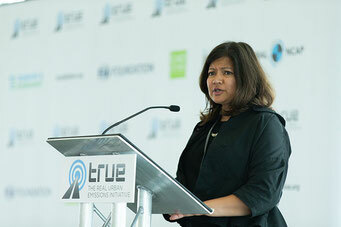 TRUE is a partnership of the FIA Foundation, the International Council on Clean Transportation, the Global New Car Assessment Programme, Transport and Environment, and C40 Cities, which seeks to bring transparency to the public debate on vehicle emissions and urban air quality. "This initial project is an important first step," said Rachel Muncrief, program director for the ICCT, "but remote sensing could take us very much further in terms of our ability to monitor, analyze, and control vehicle pollutant emissions and gain control of Europe's urban air- quality problem."